The Drug Impaired Driving Resource Centre is a fully bilingual, web-based educational resource that was developed by the Traffic Injury Research Foundation, in partnership with Desjardins Insurance. 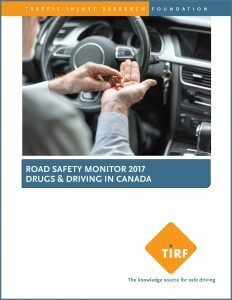 This comprehensive, accessible tool was created to inform the development of an evidence-based drug-impaired driving strategy. It was designed to meet the needs of a wide spectrum of diverse stakeholders who are seeking information about this priority topic. Drug-impaired driving represents a major challenge to road safety professionals around the world. The number of impairing substances, including over-the-counter medications (OTCs), and prescription and illegal drugs, is substantial. However, unlike research about alcohol, much less is known about the impairing effects of these substances on driving. Research is underway at an unprecedented pace to develop new knowledge and close this gap. However, this has made it challenging for policymakers, practitioners and the public to remain abreast of important issues. The objective of the DIDLC is to support the work of governments and road safety partners by sharing current knowledge about research and practice, and increasing awareness about drug-impaired driving. A consolidated base of knowledge is essential to build a common understanding of the drug-impaired driving problem, inform discussion, and achieve progress in reducing it. The Problem. 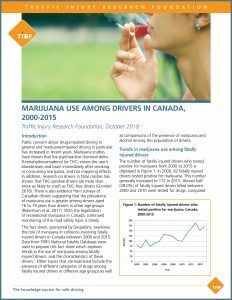 This module summarizes international research regarding the size of the drug-impaired driving problem, characteristics of drug-impaired drivers and the types of drugs most frequently detected. It includes research regarding public knowledge, attitudes, behaviours and perceptions of the problem. Effects of Drugs on Driving. This module describes the research methods typically used to investigate drug-impaired driving, and the types of drugs that are detected in drivers. It also summarizes what is known about the impairing effects of these drugs. Laws & Penalties. This module describes general approaches to laws and legal penalties that are related to drug use as well as drug-impaired driving. It also reviews the effectiveness of different types of penalties for alcohol- and drug-impaired driving offences, including criminal and administrative penalties. Tools & Technologies. This module contains information about a variety of tools and technologies that may aid in the detection and measurement of different types of drugs in a driver’s system. While some of these tools are already available and in use by law enforcement agencies in some jurisdictions, other tools are either under development or undergoing testing to gauge their sensitivity and specificity. The DIDLC also contains several free resources including fact sheets, links to research studies, program materials, experiences from other jurisdictions, and examples of practice. The information contained in the DIDLC was critically reviewed by leading, independent experts in drug-impaired driving issues. Their insight and knowledge has informed the content of the DIDLC and their valuable input is greatly appreciated. Professor Dr. Dr. (h.c.) Marilyn A. Huestis received a bachelor’s degree in biochemistry from Mount Holyoke College, a master’s degree in clinical chemistry from the University of New Mexico, and a doctoral degree in toxicology from the University of Maryland. Professor Huestis recently retired as a tenured senior investigator and Chief, Chemistry and Drug Metabolism Section, IRP, National Institute on Drug Abuse, National Institutes of Health, after 23 years of conducting controlled drug administration studies. She is an Adjunct Professor in the Department of Epidemiology and Preventive Medicine, School of Medicine, University of Maryland Baltimore. Her research program focuses on mechanisms of action of cannabinoid agonists and antagonists, effects of in utero drug exposure, oral fluid testing, driving under the influence of drugs and the neurobiology and pharmacokinetics of novel psychoactive substances. Professor Huestis’ research also explores new medication targets for cannabis dependence. Professor Huestis has been most recently awarded the 2016 Marian W. Fischman Lectureship Award from the College on Problems of Drug Dependence, 2016 Saferstein Memorial Distinguished Lecturer at Northeastern University, Excellence in Scientific Research, Women Scientist Advisory NIDA Investigator Award in 2015, Norman P. Kubasik Lectureship Award, AACC Upstate New York Section in 2015, and the Distinguished Fellow Award from the American Academy of Forensic Sciences (AAFS) in 2015. Dr. Thomas G. Brown obtained his Ph.D. in General and Experimental Psychology in 1990 at Concordia University. He is a clinical psychologist and holds positions as Assistant Professor in the Department of Psychiatry at McGill University in Montreal, Canada, Director of the Addiction Research Program of the Douglas Mental Health University Institute, and head of research and evaluation at Foster Addiction Rehabilitation Centre, a provincial health facility. Focusing on translational addiction research, Dr. Brown conducts research, including descriptive studies, randomized controlled trials, and quasi-experimental naturalistic studies, to investigate substance misusing subpopulations and evaluate the selective benefits of brief therapeutic approaches. For over 8 years, Dr. Brown has also directed the Canadian Institutes of Health Research Transdisciplinary Team into Impaired Driving. Along with Dr. Brown, his team of multidisciplinary researchers, traffic authorities, licensing program administrators and graduate trainees conduct studies examining the social, psychological, and neurobiological factors related to traffic-related risk taking. Carl Wicklund has over 40 years of experience in the corrections/human services field and is the Director of the Community Justice Division for the Volunteers of America in Minnesota where he manages a suite of prison-based programs for inmates and community-based programs for formerly incarcerated individuals including residential re-entry facilities, mentoring, support groups and a drop-in center. Carl previously served as the Executive Director of the American Probation and Parole Association (APPA) for almost two decades where he administered more than 100 grants and training and technical assistance projects, research and information clearinghouse services. He is extremely knowledgeable about learning theory and pedagogical models as well delivery methods for education, training and testing, notably with respect to remedial programs, and has overseen numerous face-to-face training programs and the development and delivery of distance learning endeavors. He was also the director of a three county adult and juvenile probation and parole departments as well as developed and managed a variety of community-based, private sector programs for juveniles and adults involved with the justice or social services systems. For eight years he was the Vice-Chair of the Global Justice Information Sharing Initiative advisory committee consisting of 35 national organizations that advised the U.S. Attorney General on cross-domain information-sharing, and was a member of the Criminal Justice Information System Advisory Policy Board which advised the Director of the Federal Bureau of Investigation (FBI). In addition, Carl has been a member of numerous nationally and internationally-oriented advisory groups that included representatives from various criminal and juvenile justice agencies. Since 2002, Stefan Steinmeyer has worked at Dräger, headquartered in Lübeck, Germany, within the Product Management Group. His focus is on breath alcohol measurement devices and drug testing systems and he has worked on product development teams. Stefan has gained considerable knowledge through market research, as well as work with practitioners across many industries and the delivery of operator trainings, product demonstrations, and participation in clinical and field evaluations. Stefan studied the chemistry of nutrition, and began his career in forensic toxicology to prepare his PhD work. He has extensive knowledge of drug research and forensic scientific work. He has authored notable scientific papers and presentations, and is a member of national and international scientific organizations, including GTFCh, TIAFT, and EWDTS. Verena Zimmermann studied Law at the University of Passau, Germany and the University of Toulouse, France, where Ms. Zimmermann specialized in European and International Law. After this, she completed a variety of traineeships at a civil court, administrative court, public prosecution department, law firms and an embassy. Verena then accepted a position as a lawyer at an international law firm in Luxemboug with a specialization in corporate law. She worked there for some time, before finally joining the Securetec Detektions-Systeme AG team in Germany. She is currently the CEO of Securetec Detektions-Systeme AG, Germany.